Northern Ireland boss, Michael O’Neill, MBE, talks football with the Queen! Michael O’Neill talked football with the Queen as he was appointed an MBE at Buckingham Palace. The Northern Ireland manager was recognised for services to football and to the community in Northern Ireland. O’Neill, who is from Ballymena but lives in Edinburgh, said the Queen remarked on how well Northern Ireland performed at Euro 2016. He said: “All the people at the palace have made it very easy for us, very welcoming, and did it with a nice sense of humour as well. The football manager said the honour was “a very personal thing”, adding: “It’s a lovely day for me, for the family. Football fans from across Ireland were honoured for their sportsmanship during Euro 2016 by the mayor of Paris. Anne Hidalgo offered the city’s most prestigious award - the Grand Vermeil - to fans from both Northern Ireland and the Republic. 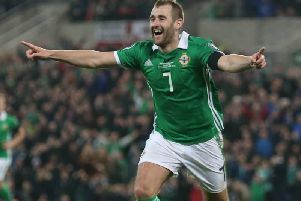 The Northern Ireland fans won hearts across Europe during the tournament, with their supporters introducing anthem ‘Will Grigg’s on Fire’ to the masses.